Some of the recipes I prepare for my home and also for friends. Plates I liked and learned to prepare, adapting to my taste and needs. also because, on certain classic preparations, every village and every family have their own original version! On this page, day after day, a new or revised recipe may appear; But also the story of a meal prepared or eaten in the company. My recipe book is full of proposals for stuffed vegetable dishes; and it is already present, for some time, also one proposal with peppers: very rich! Here, however, I wanted to propose them with a vegetarian filling that often use, very simple, enriched by a final gratin with cheese (Here, the raclette). It is a dish that, while often prepared, I had never photographed and described: I think it will appeal to many for its simplicity. When the asparagus season arrives in my kitchen and on the table it's a big party. And of recipes to prepare them I have already presented some (You can be found here), the most usual ones. 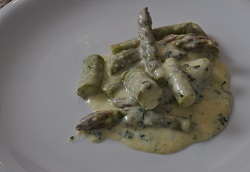 This asparagus ragout is a version a bit 'more unusual on my table but very delicate and, I would say, refined! My friend Lorenza, dear Signora Foggiana, is an inexhaustible source of recipes. What sian sweet or savory, all recipes that generously makes me participate and that I immediately put myself to try in my kitchen! Like this excellent apple pie. 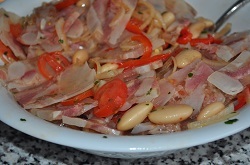 The salad nerves, onions and beans! a dish that you can absolutely adore or decline at the first impact.